Because by default settings SSH users will be able to view the entire filesystem which is not desirable. Every now and then there may be a need to give your users the ability to securely upload files to your web server. This is typically done using Secure File Transfer Protocol (SFTP), which uses SSH to provide encryption. In such scenario, you may have to give your users SSH logins. That’s where the trouble begins. By default settings, SSH users will be able to view the entire filesystem. This is not what you want. Don’t you? In this Terminal Tuts, we are going to guide you on how to configure OpenSSH to restrict access to the home directories. Let’s start modifying it. Open the sshd_config file using vim. Add the following line. If there is an existing subsystem sftp line, go ahead and modify it to match it. Next, add the following lines to the end of the file. The final edited file should look like this. When you are done, save and close the file. Restart SSH for the new settings to take effect. 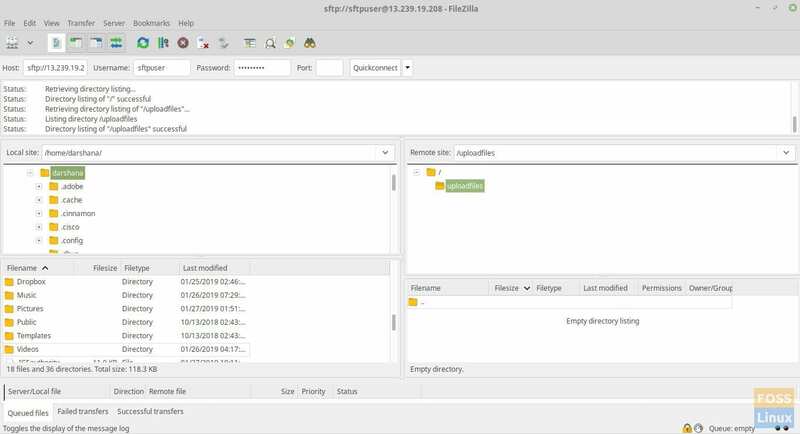 Create a user named ‘sftpuser’ using adduser command and add it to the securegroup we created. Go ahead and add existing users to the group using usermod command. The fun part begins now. We are going to restrict writing access to the HOME folder of a jailed SFTP user. Start by changing the sftp user Home directory ownership using chown command. 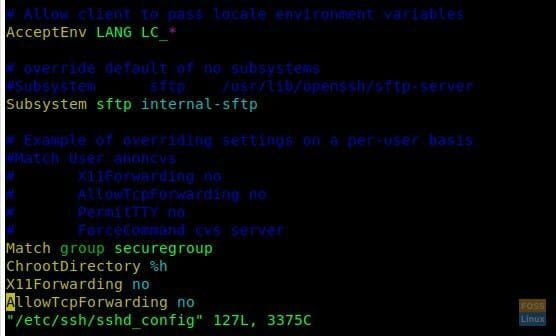 Modify the sftp user home directory permissions by using chmod command. The user should be able to access the account using SFTP and can upload documents to a given directory. To verify everything is working as intended, use an FTP client like Filezilla and login to the server. Enter server IP, user name and password. Port should be 22. You should not be able to access the home directory with the restricted user account. During a situation where your client wants to upload files/images to someplace in the web document root, you can mount the needed folder to sftpuser folder. For example, we are going to mount /var/www/html/webapp/pub/media to sftpuser folder. Here we are using a bind mount to mount folder. Add the following line to file. Save and exit the file. Try using your favorite SFTP client and log in as a sftpuser. You should be able to see the media folder contents. That’s it for today. You should have by now learned how to configure and verify a Jail SFTP user. Feel free to ask any questions you have in the comments below.